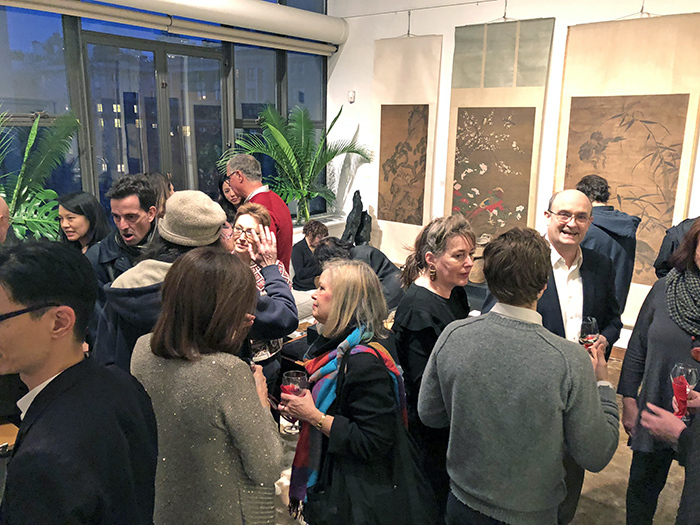 Above: people and paintings at the opening party for Kaikodo LLC's exhibition "Parallel Lives." As the sun sets on Day 4 of our 2018 edition, let's take a moment to reflect on these opening days as we gear up for another busy week ahead. Below is a selection of photos taken in and around the galleries. Asia Week New York got off to a festive start with a cocktail reception hosted by Aman, our 2018 Presenting Sponsor, at the stunning Upper East side residence of interior designer Sandra Nunnerley. Read more about the evening here. On Wednesday and Thursday, journalists previewed the artwork on offer during our annual press walk—a whirlwind tour of the 40+ gallery exhibitions. Above, a group shot taken at Dai Ichi Arts, Ltd.
James Lally of J. J. Lally & Co. presented his selection of ancient Chinese jade to the press. On Friday evening, many dealers held opening receptions for their exhibitions. Above, the opening of "Chittaprosad, 1915–1978: A Retrospective" at DAG. On Saturday and Sunday, all 45 dealers opened their doors to the public for our annual Open House Weekend. Above, the inviting setup at Findlay Galleries. Our dealers are renowned Asian art specialists with a wealth of knowledge, and are always willing to strike up a conversation with visitors, be they budding enthusiasts or seasoned collectors. Above, Richard Waldman of the Art of Japan (left) and Andrew Kahane. Competition among dealers can be fierce! Arms and armor specialist Runjeet Singh demonstrates his wares to fellow exhibitor Alexis Renard (rest assured, no one was harmed in the taking of this photo). Despite relatively low temperatures over the weekend, visitors flocked to the galleries. Above, the well-insulated crowd at Onishi Gallery. Most exhibitions remain open until March 24, so there's still plenty of time to discover what The New York Times called "Asia Week's rare and unusual objects." See you in the galleries!